While whole car seats aren’t recyclable, they can be recycled in pieces. You’ll need to disassemble the seat so you can recycle the plastic, metal and fabric components separately. You can donate a car seat, but only if it has never been in an accident, if it has not expired, and if the straps haven’t been chemically cleaned. Some donation centers will not accept car seats, so look for organizations that provide family services, like women’s shelters. Recycle Your Car Seat has compiled a list of programs that recycle car seats in the United States, complete with instructions specific to each one. See a list of locations here. 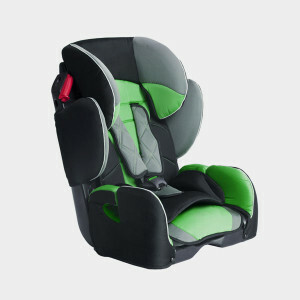 You can recycle Clek car seats for a $40 fee, which Clek will give back to you in store credit. Contact their customer service to receive a UPS label, ship your seat and shop online to replace it. Find out more here. Car seat expiration dates (or 6 years, if unmarked) shouldn’t be overlooked. Even if the car seat doesn’t look damaged, the materials it’s made out of degrade over time, especially with regular exposure to UV light through car windows. Be careful when buying used: only accept a used car seat from someone you know and trust. When buying a car seat, green isn’t always best. Experts don’t recommend buying used, even though it’s greener than buying new. Organic seat covers won’t shield your child from the toxic leaching of flame-retardant materials, either. If you want to incorporate being green and healthy into your car seat choice, check out Healthy Stuff’s Children’s Car Seat Study.